The parents of Colorado school gunman Karl Pierson said Monday that they are "shattered" by the shooting and don't understand why he critically wounded a classmate and then killed himself. "We are shattered by the tragic events that took place on Friday at Arapahoe High School," Barbara and Mark Pierson said in a statement issued by a family spokeswoman. 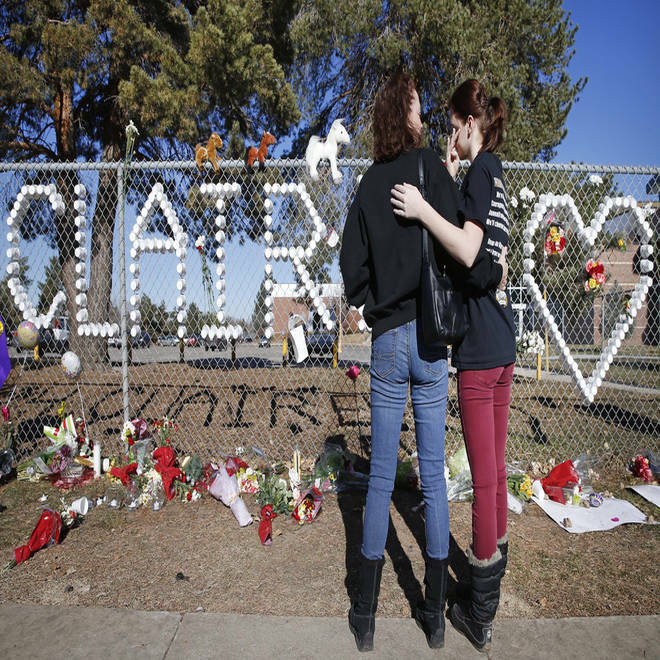 Claire Davis, 17, is in a coma fighting for her life - she was the student shot by one of her classmates at Arapahoe High. On Monday, the parents of the 18-year-old who shot her came forward for the first time publicly, saying their thoughts are with the Davis family, and they are devastated by what their son has done. NBC's Ron Mott reports. The couple said they were praying for the 17-year-old senior Pierson shot in the head as he hunted for the school staffer who had benched him on the debate team. "Our thoughts and prayers are with Claire Davis and her family. They, and she, have suffered unimaginably, and we pray for her full recovery. We also pray for the entire Arapahoe High School community, as we know your lives are forever changed by this horrific event. "As parents, we loved our son Karl dearly and we are devastated by what happened Friday. We cannot begin to understand why Karl did what he did. We ask for privacy during this unthinkably difficult time and hope that you will respect our need for time to grieve." A classmate told NBC News that Karl Pierson was an avid reader of a notorious bomb-making bible, "The Anarchist Cookbook" and was packing a grudge against debate coach Tracy Murphy, the school librarian. “Speech and debate was his life, and the fact that he wasn’t there crushed him a little bit and made him really tense and angry,” Joe Redmond, the team co-captain said. At midday on Friday, Pierson showed up at the Centennial, Colo., school with a pump-action shotgun, ammunition strapped to his chest, a machete and Molotov cocktails — and headed for the library. Claire was in critical condition, stable but in a coma, her family said in a statement released through the hospital. Police said she and Pierson were not friends. Redmond said he spoke to Pierson as recently as Monday about the possibility of returning to the debate team. NBC News' Ron Mott contributed to this report.